Since Food, Inc. is up for an Oscar on Sunday, it seems as good a time as any to compile a list of documentary food films worth watching. A recent post on favorite feature films that focus on food garnered a lot of comments — and sparked a movie mystery that remains unsolved. For cinematic sleuths, check out the comments by “can’t remember,” and see if you can put your finger on the name of the mystery flick. Thanks to regular readers Susan Rubin and Margaret Phillips for input for this post. In alpha order, a list of ten real food films worth viewing while noshing on a modest-sized serving of organic, non-GMO popcorn. A funny, thoughtful, and, um grounded look at the fundamental ingredient vital to everything that feeds us. An amusing account of modern American ag policy and food culture that sprouted a counter-revolution among veggie-obsessed Californians. Down with the corporate behemoths of the American food economy who threaten the country’s food security, livelihood of small farmers, and our choices as consumers. This doco features fresh thinking from urban farming activist Will Allen and sustainable farmer Joel Salatin. This film tackles the giant-sized topic of America’s obesity epidemic with talking heads and the story of a 12-year-old who undergoes liposuction. Two friends head to the heartland to learn a thing or two about how food is farmed and where food comes from. Cult classic with Morgan Spurlock eating his way to bad health on a month’s worth of Maccas. Required viewing for fast food fans. A group of mostly working class, Latino South Central Farmers fought the good fight — and they’re still at it — for the basic human need to grow food, in this Academy Award nominated film. Deborah Koons Garcia reveals the unappetizing truth about genetically modified foods: Do you really know what you’re dishing up for dinner? A flamboyant farmer turns his family’s dying farm into a thriving CSA (Community Supported Agriculture). Bonus: He flaunts a feather boa while driving his tractor. Special mention to a work-in-progress: A film-and-food couple reveal how hard it is to eat well on a really tight budget. Okay, what’s missing — or doesn’t deserve to be in this line up? You know you have an opinion, oh yes you do. Let me know below. This entry was posted on March 6, 2010 at 2:04 PM and is filed under food in films. You can follow any responses to this entry through the RSS 2.0 feed. You can leave a response, or trackback from your own site. Thanks for this comprehensive list of food films. i need to check some of these out. One that I love is Our Daily Bread. No dialogue, just an interesting look at food industry processes. Fascinating!! Check it out. Thanks for the heads up, Edwina. I’ll be sure to check it out. I haven’t seen any of these. I’m afraid it will make it impossible for me to eat anything but lettuce grown in my own back garden! Great list. I would add As We Sow by Jan Weber (full disclosure: she’s a friend of mine). 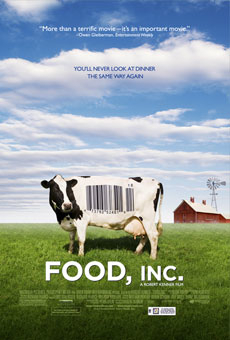 Food, Inc. was really well done – I want to see Fresh as well! Oh. King Corn is perfect for people who won’t actually sit and read “Ominvore’s Dilemma” – such as my husband. Have yet to see Food, Inc, but want to! And of course, Super Size Me – ugh. I was disappointed by the documentary win. I really felt Food, Inc. was an amazing movie that needed a boost. Instead, the Academy opted for The Cove, which I watched Saturday night. The Cove limits itself to one outrage in Japan, the killing of dolphins, whose meat is fed to Japanese children, increasing their body burden of mercury. Food, Inc. describes how all our food here in the USA is being altered, how the subsidized crops corn and soybeans turn up in many packaged foods, how Monsanto is forcing out the small farmer and imposing genetically modified seeds. I felt sick after watching both documentaries, but think the message of Food, Inc. is more urgent and should be watched by all foodies so they can help spread the word. Nice roundup! I’ve only seen like one of them, but I’d love to see them all. “The World According to Monsanto” is a great documentary. They do a great job of exposing how U.S. politicians and government agencies are selling out, along with most of the world for that matter, to greedy corporations. It’s got GMO, rBGH, frivolous lawsuits, government lobbying, and much more. It opened my mom’s eyes, she had no idea of the danger of GMO’s and the extent to which they are used in the USA.